A Place for Reviews: Up, Up, And Amazing! It's official now more than ever: Pixar is an unstoppable force in animation with a name that is synonymous with quality. It's as if this studio is incapable of creating a bad movie, although I did have my minor issues with "Cars." Nonetheless, the studio is on its tenth feature, and the momentum is all still there. The latest and first 3-D feature, "Up," may not be the transcendent masterpiece "WALL-E" was, but it's still a brilliantly high-flying adventure that acts as a buoyant hymn to the imagination. It's pure movie magic and proves once again that Pixar refuses to dumb anything down for the kids; this is excellent entertainment for all. The movie is directed by Pete Doctor who directed "Monster's, Inc.," wrote "Toy Story," and co-wrote "WALL-E." It's also co-directed by Bob Peterson who wrote "Finding Nemo." So, as you can see, this wondrous film has the best of the best in animation working behind it, and it shows. "Up" begins with a love story that is of the sincerest you'll ever see on screen. As a young child, Carl Fredrickson (Edward Asner) idolizes an adventurer named Charles Muntz (Christopher Plummer) who he admiringly watches in newsreels. Muntz travels around in a gigantic blimp to faraway lands bringing back bones of animals unknown to man. His findings get labeled as fraudulent, though, which then leads him to banish himself to South America where he vows to stay until he can find the animal he claimed to have discovered and bring it back alive to prove himself. With such inspiration, Carl longs for similar adventures and soon comes to find a young girl who shares his passion. Her name is Ellie, and she and Carl grow up, fall in love, get married, make a quaint home together, and save loose change in a glass jug in hopes of saving up for the adventure they had always wanted. Their dream is Paradise Falls, but other life responsibilities get in the way. They never make it there, and Ellie passes away. This tear-jerking and heartfelt introduction plays out in a nearly silent montage that is absolute perfection. We're then left to watch Carl's life without Ellie. He's held on to the house even though greedy, capitalistic development surrounds him. Upon being threatened to be sent to a retirement home, Carl comes up with a plan, one that literally sends the movie into flight. Just when he thought loneliness would overcome him, he's floating far away on to finally fulfill Ellie's dream of reaching Paradise Falls. 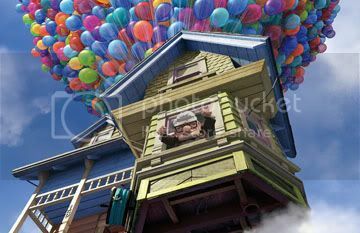 With a massive and elaborately multi-colored bouquet of balloons, Carl lifts his house up and sets his compass to South America. Little does he know, however, that he has someone coming along for the ride. It's a bouncy, energetic boy scout named Russell (Jordan Nagai) who is at first an unwelcome addition in the eyes of the disgruntled Carl, but he turns out to be entirely valuable not so much as an adventurer, but rather, as a friend. Once landed on the massive plateau that Carl and Russell have to cross in order to reach Paradise Falls, they strap themselves to Carl's house with a garden hose and drag it around as if it's the bearer and also burden of dreams. Of what do those dreams consist? Companionship, and they end up finding it in the most miraculous place. It just so happens that both Russell and Carl are in search of that someone, and while Carl still speaks to Ellie as if she were still around, the truth is that she wants him to move on as much as he's not yet ready to let go. Among the things this wonderfully odd couple comes across in South America is a dog named Dug who has been fashioned with a robotic collar that humorously allows him to speak. There's also a strange and exotic bird who Russell names Kevin. Russell becomes attached to these two unexpected visitors, and against Carl's pleas, they, too, come along for the trek. They also encounter an entire clan of talking dogs from which Dug came, and this clan eventually leads them to Carl's childhood hero, Muntz, and his fantastic blimp. And I've already said too much as the fun is in the journey and not knowing what happens next. It's fascinating to note that arguably the summer's biggest and boldest adventure has a 78-year-old man and an 8-year-old boy as its forefront heroes, and it couldn't be any more fitting with the wonderful message the movie has to share, and that is to celebrate life by simply living out your own adventure whatever that may be. This is Pixar's first PG-rated feature since "The Incredibles," and although it's not nearly as violent as that, there are moments throughout the perilous journey that'll have you antsy and nervous with anticipation. It's a rousing and exhilarating fantasy that has meaning behind the swirling action that accumulates. We care about the outcome of these fully fleshed-out characters due to the way we've come to know them so well throughout their trek. It all adds up to an experience that is emotionally nostalgic and poetically touching. It's also one of the laugh-out-loud funniest Pixar pictures to date. As it was the opening film at this year's Cannes Film Festival, "Up" certainly doesn't lack in artistry. There is some gorgeous imagery of the house strung to its bouquet of balloons as set against different shades whether it's a setting sun or a bright clear blue sky dotted with puffy, white clouds. The beautiful score by Michael Giacchino keeps things gliding along, too. And while the 3-D does make the scenery pop and does wonders for the look of the balloons, the fact is that the glasses are dark, which inevitably makes the bright color palette of the entire movie a lot darker, too. I'm glad to have seen it in 3-D, but I would like to see the movie again and in 2-D. It's not like I need that excuse to want to see it a second time, either, because I want to witness the loving sense of exploration all over again anyway. "Up" soars above as the best film so far this year, so let's just hand out the Oscar for Best Animated Film already. SQUIRREL! Loved UP, and I too want to return for 2D :) Great review, hope your summer is going well!